Weeping gold ceramics and pottery covers a broad category of vintage ware. Many manufacturers have produced pieces glazed with dripping and mottled gold. These pieces can be purchased at bargain rates from thrift stores, collectible shops and online retailers. Collecting is highly personal, but these unusual-looking pieces can be called "precious" for their metal content alone. Random dripping and spattered gold glazes are the mark of a weeping gold piece. Authentic weeping gold glazes contain real gold. The gold content will be marked on the bottom with indicators such as "22 karat," "22K," "24K," "24 karat gold" or "Warranted 22-K." Precious metal glazes are suspended in liquid before application and come in different grades, which the karat number indicates. Weeping gold pieces come in myriad shapes. Small trays, handled servers, vases, planters, candlesticks, candy dishes, coffee pitcher sets and animal figures can be found. Weeping gold glazes were used by many china manufacturers and potteries. McCoy is the best known. Some named china brands, such as Savoy, were off-shoots of larger, unidentified companies and may be difficult to track down. Other makers include Dixon Art Pottery, Swetye, Bel-Terr, LeMieux, Gold Craft and Pioneer Pottery Company. Many weeping gold pieces are not marked on the bottom with the name of a specific pottery company or manufacturer. Real gold pieces are stamped with the gold grade or have indications such as "Hand Decorated 22 K. Gold U.S.A." Paper or embossed foil labels were also used. Some are marked with the manufacturer's name. McCoy pieces will be marked with their name and "USA" or "Made in the USA," either embossed or incised. The style of the lettering helps to identify its approximate date. Weeping gold pieces have been found with McCoy markings indicating they were made in the period between 1940 through the 1960s. Weeping gold ceramics are considered collectible, but are not highly valued monetarily. 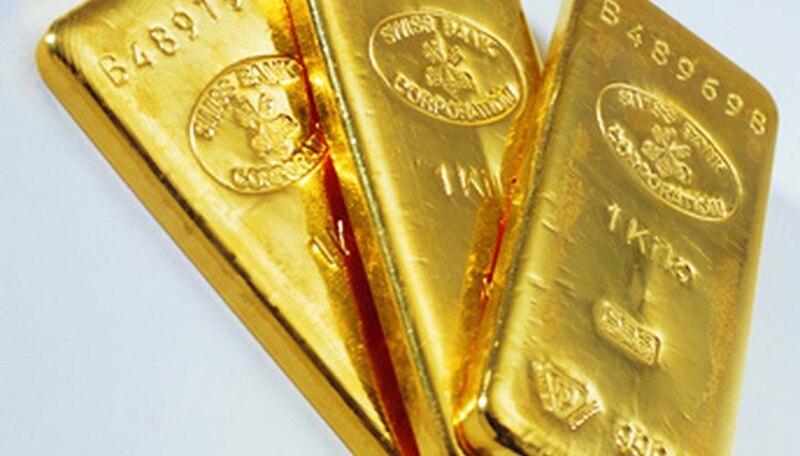 Pieces marked with their gold content and the manufacturer's name will be higher in value. McCoy pieces are sought after as collectibles. This raises the price of any McCoy piece in perfect condition. Shop online at auctions to get an overview of the market for weeping gold. Visit collectible and antiques shops. Shop owners can be generous with their knowledge. Ask the owners for information on ceramics glazed with mottled gold. They may be able to secure them from another source or lead you to other places to obtain them. Thrift shops are also great places to find bargains on vintage pottery and ceramics. LN Shapely is a published columnist, musician and broadcast commentator. Her work has appeared in regional and national magazines, newspapers and on the Web. She holds a degree in architectural and interior design from Stephens College in Columbia, Mo.